Quality Manual – ISO 9001 Manual is a typical form of main document used in drawing up and implementing a quality system. It is expected to provide an adequate description of the Management intention to fulfill system requirement while serving as a permanent reference for implementation and maintenance of the system. An ISO 9001 Manual should be first evolved by the Chief Executive. He can take the help of senior managers. A person from the steering committee who is from the top management should write the Quality Manual. In most of the cases, the management representative writes the manual. Based on the company’s ISO 9001 Quality Policy, the broad objectives and activities for each department have to be decided and fitted into the relevant clauses. For this, the department heads should give draft write-up of the activities in their department. Then it should be meticulously scrutinized to ensure that the system is sufficient to achieve the company’s Quality Policy objectives or benchmarks. The clauses applicable to each department of the company are identified. Organisation chart should be chalked out and the responsibility and authority of each personnel mentioned in the organisation chart should be documented. Personnel authorized to take decisions must be included in the organisation chart. Preparation of the chart will help in identifying and documenting the responsibility for activities under each clause. A suitable numbering system, department wise and clause wise should be decided which can be made applicable to the remaining tiers of documentation. 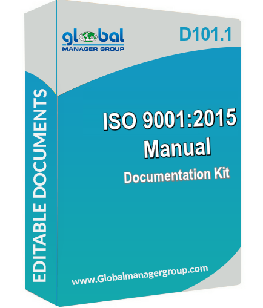 This will help in cross-referencing ISO 9001 quality manual with other tiers of documentation like, procedures, work instructions and records. It is very important that all the tiers should have cross linkages with each other. No confidential document / procedure should be included in the Quality Manual because it is an open document. After preparing the draft of ISO 9001 Manual it should be circulated to all department heads to ensure that there is no discrepancy or that no important activity it left out. After their approval, the final draft should be prepared. The final draft should have company name and logo, issue number, issue date, controlled-copy identification on each page, page number and signature of preparing and approving authority. How to Keep Your ISO 9001 Manual Relevant? The first step in building an ISO 9001 Quality Management System is the creation of a “Quality Manual“. This is a separate and distinct step from developing quality procedures. The aim is to establish, in a short and concise format, the policies and objectives of the company required to achieve a desired level of quality for the organization or division. ISO 9001 manual should be the document where the organization itself, its quality management system, and even his way of thinking and this quality management approach. What should your ISO 9001 manual contain? The objectives and vision of your company: To set the tone for your ISO 9001 manual, start with the answer to a question: Why does this company exist? Remember, your company does more than just making a product or providing a service. Its purpose involves improving people’s lives in a specific way. Figure out how, and write that down. Products and services: For any product you create or service you fulfil, define the process behind it in the ISO 9001 manual. The quality depends to a large extent on consistency, therefore, clarify your expectations. The definition of quality management system of your company: By itself, the word ‘quality’ is vague. Specifically define what is important to your client. The relationship between different departments: Few products come from just one department. Be sure to define how different parts of your company work together. The easiest way to do this is with a clear flow chart. Most Quality Manuals manage to formally meet the requirements of the ISO 9001 standard, and yet miss the point of the document because it covers too much duplicated or unnecessary information. The result is one of the most fundamental documents of a QMS that no one reads – except for a few certification auditors. ISO 9001: 2015 quality manual should be the document where the organization itself, its quality management system, and even his way of thinking and this quality management approach. QMS 9001: 2015 quality manual gives the impression of an organization that knows what it is – an organization that manages its quality management system. A good quality manual facilitates the work of the auditor, and gives him the opportunity to better audit the system – and with his observations, actually contribute to the improvement of the system. And what is more important, such manual quality is worth the management representative and process owners as it provide a comprehensive insight into the quality management system. This new non-binding ISO 9001:2015 manual that will replace old version of the Quality Manual that contains all other requirements. The ISO 9001:2015 manual considered as an over simplification because organization’s mission and vision are added in this context, this document would make sense and it would meet most of the requirements and this document can effectively become the brochure that will introduce company to future clients. This new version of the standard is not a slave to formality and will require a more creative approach for getting the maximum out of each requirement, adapting to the organization’s needs instead of piling up useless documents. The ISO 9001 manual for quality management system certification is first tire document required for ISO 9001 documentation. ISO 9001 manual contains clause wise details for how ISO 9001 systems is implemented. ISO 9001 Manual should covers list of quality procedures, company profile, amendment sheet, product realization, index, resource management, sample quality policy, organization chart as well as clause wise details as per ISO 9001:2008 requirements for implementation of Quality Management System. The ISO 9001 documents designed and developed quality consultant. ISO 9001 documents are requirements for Quality Management System. 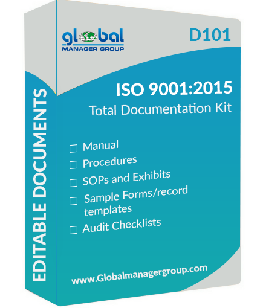 ISO 9001 documentation kit including iso 9001 quality manual, quality assurance procedures, process flow charts, SOP, sample blank forms and formats, templates as wall as iso 9001 audit checklist all documents written in English planning and easy downloading and save much time. ISO 9001 documents must require for ISO 9001 certification and implementation of Quality Management System. ISO 9001 manual documents is required for quality policy and describes the micro level Quality system including details for how the ISO 9001 standard requirements. ISO 9001 procedures for management hand book and describes department activity for a system approach to supply consistent Quality Product. This documents requirements of the ISO: 9000 standard and the Quality Policy of the company. ISO 9001 policy documents for work instructions operating procedure. ISO 9001 policy documents including processes, flow chart and process which helps to operators and quality control test method. ISO 9001 sample forms are supporting documents use company record and different procedures in their organization. ISO 9001 audit checklist is designed with the helps of iso 9001 auditor for implementing and verifying quality management system.